There was a time when fibreglass boats incorporated a lot of timber: bracing the bottom and decks, the deck itself, the core of the transom and so on. Eventually the timber absorbs water, swells and finally rots. One legendary builder cored his transoms with chipboard; they practically exploded. Cruise Craft has banned timber entirely. This boat is capable of lasting practically forever, for seven years of which it is covered by warranty. The Queensland boat building industry has lost a lot of familiar names in recent years. Cruise Craft is a survivor, and they have held their place by upholding their reputation for first class design, structure and finish rather than building to a price. 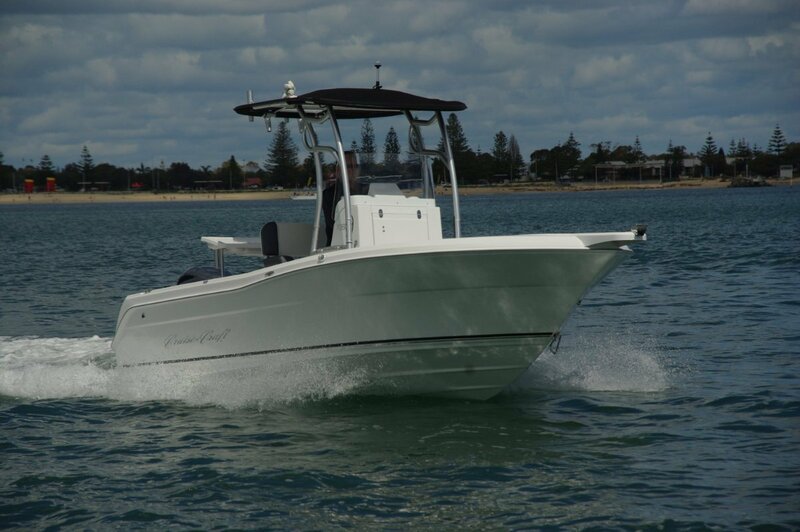 The review Cruise Craft is certainly not a cheapy, but it is very much a complete package offering the dedicated fisho plenty to dream about. 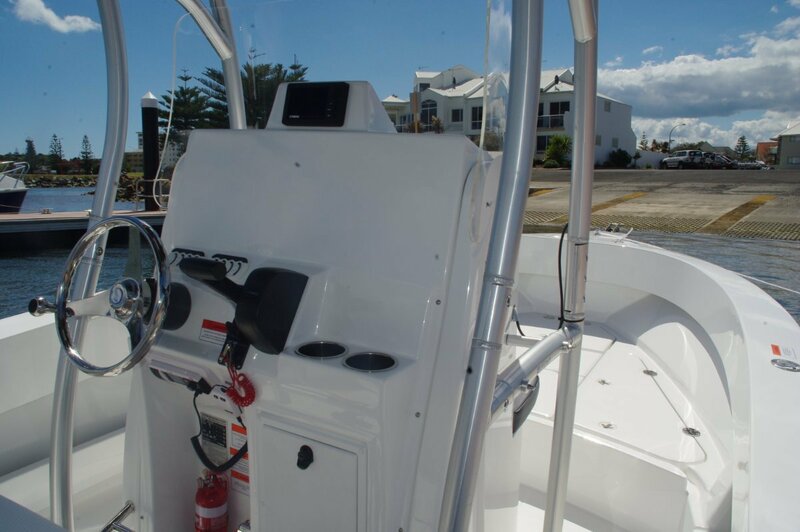 Like most fishing dream machines the layout is centre console. The layout of controls on the console is interesting. The wheel is offset to port with the throttle-gear lever midway between the wheel (stainless steel and equipped with a knob for slick manoeuvring) and the starboard edge. There is sense at work here: two people are likely to be sitting here so the wheel needs to be at one side or the other. Put it to starboard and the throttle would get mounted on the outboard edge of the console, right where it is inconvenient. It is a thoughtful console all round. Everything from EPIRB to VHF microphone is tidily located; even drink holders have a moulded platform. There is a very big volume of storage space within the console, reached by activating the gas lift at its front. A smaller locker is adjacent to the driver. If you do not like the way the console’s panel is arranged, you can unscrew it and install a different one. The excellent T-top is supported by a frame apparently beefy enough to carry a helicopter pad; it is also a first class handhold. The double driving seat is mounted on a similar structure that would probably allow an esky to be stowed under it. Importantly, the bracing is console mounted rather than on the coaming where it would hamper an angler. That angler is a pampered person here. The coaming is not only minus the bracing: the four cleats are pop ups, and the side grab rail is recessed. Not a single snag in sight. He or she has plenty of other goodies including a large area platform at the bow. Beneath it is abundant dry storage plus a large holding tank that is plumbed to right aft. Aft are a live bait tank and a bait tray to handle its contents. The angler who scores the position here is thoroughly pampered by thigh padding. Ample rod holders are laid on: sockets in the coaming (along with gaff holders), rocket launchers on the T-top. Care and feeding of the rods is handled by a built in three-drawer tackle box. 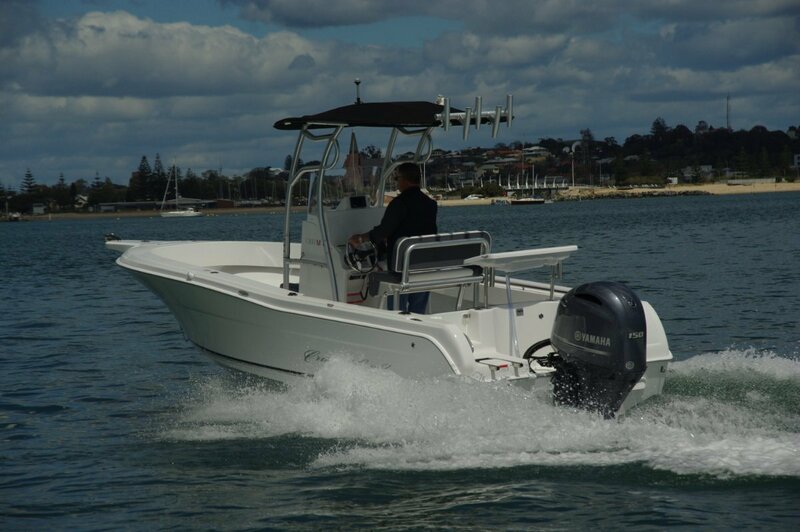 Wash downs at sea are aided by a self draining deck and a salt water deck wash.
As well as being natural fishers centre consoles make roomy day boats. For the passenger carrying role there is a double seat at the console’s front as well as the twin bolster driving seats. An optional cushion converts the platform into a vast sprawling area. For either role the dual battery system multiplies the built in safety. 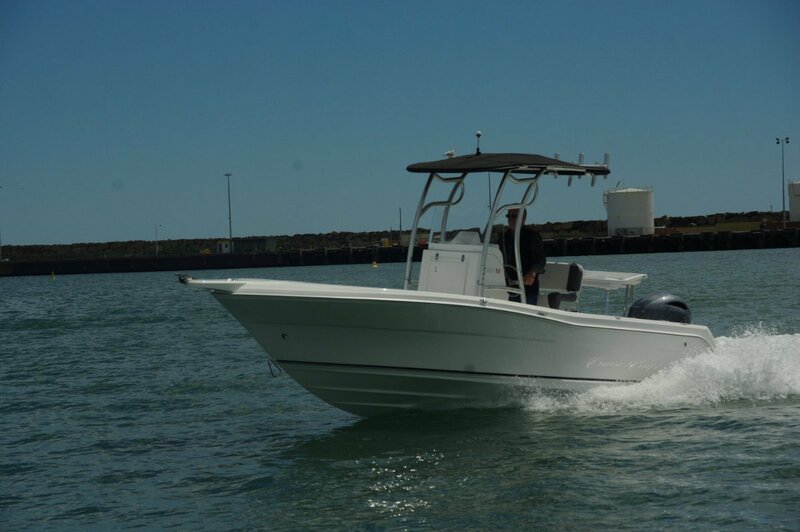 The hydraulically steered 150hp Yamaha is a good match with the Cruise Craft. It jumps rather than crawls onto the plane, gives good response to the trim button and delivers cruising speed at modest and economical revs. This is a quiet motor, but it provided just about all the sound under way. Fibreglass hulls are naturally quiet; coupled with foam filling, this one is almost silent. We did not wet a line but simulated fishing by well fed males demonstrated thoroughly acceptable stability. At journey’s end the ease of trailing gave the kind of finish to a day’s boating we would all like. The drive-on trailer was expertly set up and equipped with catch and release. Too easy.